Pollution can cause skin damage, heart problems, respiratory diseases, and even lung cancer. When we talk about the most polluted countries we always think about China and India but other countries in Asia like South Korea, Thailand and Vietnam and big cities like Jakarta (or even Kuala Lumpur when the haze reaches the city or in the industrial areas), are also quite affected, with AQI (Air Quality Index) levels of more than 100 during some times of the year. The World Health Organization (WHO) considers AQI levels under 25 to be acceptable for humans to breath regularly. In my experience traveling around some of the main cities in the Asia Pacific area I only found those low levels around 25 in some areas of New Zealand. I’m sure besides New Zealand there are also other countries with clean areas, but it seems difficult to find those low level in the urban areas, where most of us live. The most damaging air pollutants are fine particles less than 2.5 micrometers, also known as PM 2.5 that includes pollutants such us sulfate, nitrates, and black carbon, which pose the greatest risk to human health. Heavily industrialized areas and big cities have the highest levels of pollution. If exposure to pollution is combined with high UV index, then the damaging effect on the skin is even higher. Regardless of where the pollution is generated, it affects to all the countries in the world. 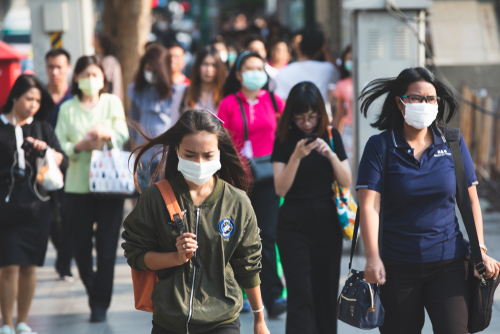 From our side, what can we do is to follow some healthy habits like checking the AQI before doing outdoor activities; wearing a mask outside when the quality of the air is not good; eating foods with antioxidant properties; avoid sun exposure when AQI is high; do hiking in natural areas away from the main cities. Children and old people are even more vulnerable to pollution. Although pollution is something quite complex, we have developed the oral ingredient ZeroPollution to help to prevent and repair some of the damaging effects linked to pollution exposure, especially on the skin. We all have our busy lives and we cannot always follow the healthy habits we should, leaving the skin exposed to air pollutants. ZeroPollution has some natural active compounds that, as shown in our research, enhances resistance to oxidative stress caused by pollution, reduces the skin inflammation, inhibits the overactivation of the Hydrocarbon Aryl receptor (AhR), inhibits the overexpression of metallothionine MT-1H and protects skin cells from harmful UV Rays. ZeroPollution is already commercially available in powder form and is suitable for both oral and topical application.